No matter your organization’s size or industry, the employment and labor team at Miller Johnson can help you navigate the often confusing regulations and requirements surrounding employee and workplace issues. Our employment and labor attorneys educate and guide clients in establishing policies and practices which build workplace rapport, reduce operational expenses and risk, and safeguard against the increasing pressure of lawsuits. Join us in Grand Rapids on Tuesday, October 30 at DeVos Place. This half-day seminar will focus on issues and situations employers deal with on a daily basis. Attend breakout sessions, earn HRCI and SHRM credits and network with your peers all before lunch. Scroll down for additional event details. You are welcome to register on-site at DeVos Place between 7:30 and 8:00 am on Tuesday, October 30. To make on-site registration easier, complete and bring this form with you to the Help Desk. Program materials and snacks are included with every registration. Program materials are provided online in advance of the seminar. * For purposes of this seminar, a client is defined as an organization that has paid Miller Johnson for legal services in the past two years. Only those in attendance will receive certification documentation. SHRM – This program is valid for 4.0 Professional Development Credits (PDCs) for the SHRM-CP or SHRM-SCP. 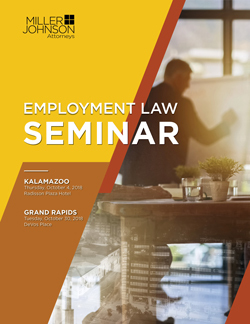 Click here to subscribe to receive the employment and labor law email updates and professional development information. If you have questions about this seminar, please email Amy Sgro.